If you're already creating great news content, it’s relatively easy to get it indexed in Google News and the traffic can be substantial. 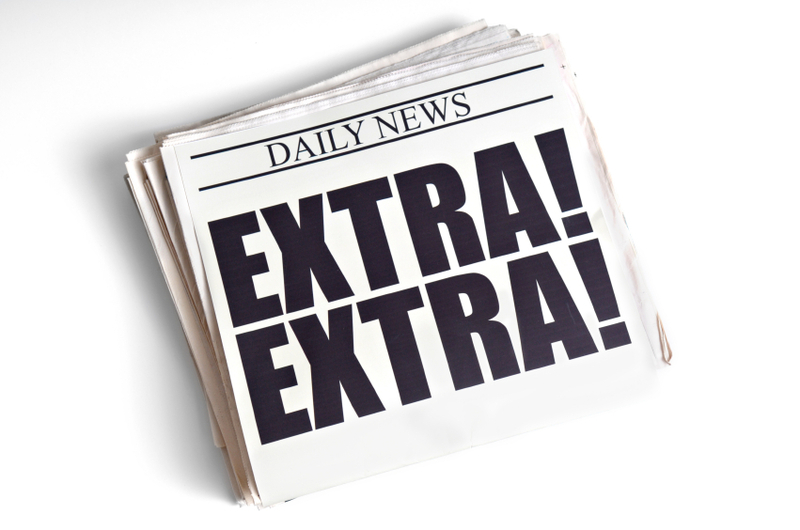 Here are some strategies for getting the most out of your content in Google News. When Google News results are pulled into Google’s main SERPs, it offers a great opportunity to rank for head terms that you would never normally dream of, albeit for a limited time period. In my experience it's fairly simple to optimise for it - use the keyword in your headline and body. This observation has also been noted by Barry Adams over at State of Search. Barry also states that articles must appear on a generic news site. I’d agree that bigger sites tend to get pulled in more often, but take the example below where 2 of the results for “ipad” are specific gadget websites (CNET and ZDNET). Universal News results for "iPad"
This can result in traffic spikes for really high volume terms such as “facebook”, although these only last for a short amount of time because the turnover is so fast. But if you’re writing an article about Facebook anyway, there’s no harm in making sure you use the company's name in the headline to see if you can pick up some extra traffic. On the other hand, if there’s a more niche phrase that you just can’t rank for in the standard organic results, you might only have to publish content every couple of days to stay fairly visible in the News box. These approaches don't necessarily deliver high quality, targetted, relevant traffic, but that’s not always important to everyone! The Telegraph are extremely diligent with this tactic and seem to reap the rewards accordingly. 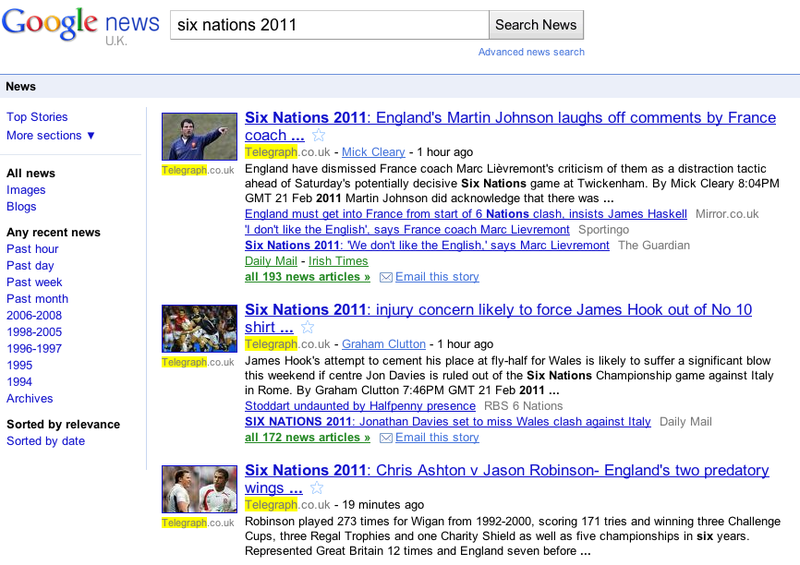 Take the current Six Nations rugby tournament as an example - a search in Google News UK brings back a results page where they occupy 5 of the 10 main slots, and 3 further sub-slots. They’ve also got 7 of the 10 thumbnails (we’ll get on to that next). As a bonus, they’ll be getting even more traffic from the organic SERPs news box, where they pick up 2 of the 3 results and the thumbnail for “six nations”. The Telegraph may receive a boost as a highly trusted source, but this simple tactic could be employed by smaller sites within their own niche. 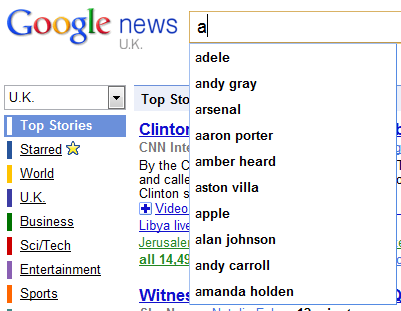 One of the great things about Google News is that you’re competiting with a reduced field compared to standard SERPs. There are even fewer competitors within image optimisation - of the the sites that are included in Google News, not all of them use images in their articles, and the ones that do might not necessarily optimise them well. Use clean HTML image tags, and don’t make the image a link. Citation Rank is Google News’ means of identifying who has broken a story, which is taken into account as a ranking factor. If you’re the first to publish a story and several sources reference you, it’s a strong indication of authority on the subject. Are there layers of approval that you can remove specifically for breaking news? Are there crucial times when there’s nobody in the office? Can writers publish from home or on their laptops remotely? Speak to your development team to make sure your News Sitemap is updating as soon as new content is published. 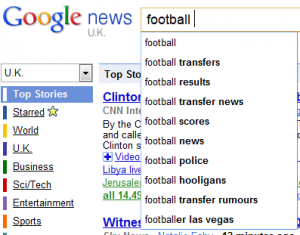 You will often see news sites publish a brief leading article immediately (I’ve noticed that the BBC’s sport section does this often) and update it later with a more comprehensive piece - Google News recrawls content so your updates will be indexed. This is a valid technique if you want to be first to publish, but don’t make it too brief as you might start seeing the “Article too short” error in Webmaster Tools. Google’s help page gives 80 words as a minimum. build up a strong and influential following on social media sites like Twitter, and promote your content to them as soon as it's published. Keyword research poses a specific problem for news sites: most keyword data is retrospective, but news is being written about in the moment. But now that Google Insights for Search has added the capability to search by a specific date range, it could be a powerful tool for news websites. 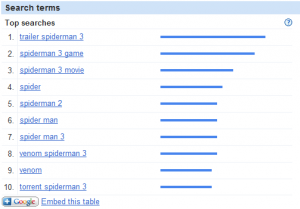 For example, if you want to know what people are going to be searching for when the next Spiderman movie is released, why not look at the data for the last one? 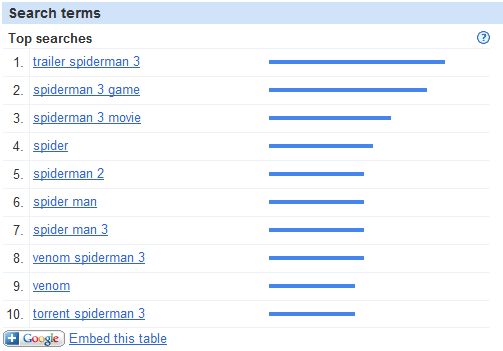 Check out Spiderman 3's Wikipedia page and you can see that it was launch through April and May in 2007. 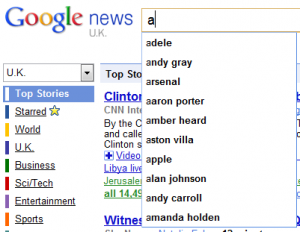 But if you really want live keyword data, the closest you'll get is Google News’ own suggest/autocomplete feature, which seems to update within as little as 10 hours according to Malcolm Coles’ tests. This is much quicker (I think) than nearly every other keyword tool so it’s definitely worth checking out, but you should be aware of it's limitations too. This could be used to put together a useful dashboard for your editorial teams at the beginning of each day, especially if you had a means of scraping this data at scale. A lot of people seem to get frustrated with Google News’ inclusion process, during which feedback from Google can be scarce. 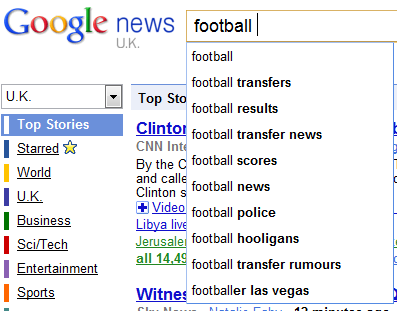 The first question any site owner ought to ask themselves is “Does my site belong in Google News?”. There’s no way to trick GN into accepting your site - if it’s e-commerce, a forum, a one man blog, then you’re probably better off spending your time pursuing other promotion techniques. Secondly, make sure that you meet ALL of the technical requirements. The most common issue tends do be around implementing unique numbers at the end of article URLs. You can get around this by using a News Sitemap but I would recommend both - the sitemap can help with rapid indexing, but if it breaks (which does happen) and your article URLs don’t have a unique number, your content will stop getting indexed. If you plan on implementing the unique numbers in your URLs, it’s worth doing so prospectively - if you implement it on all of your historical articles you’ll have to set up a lot of redirects, and Google News won’t index that old content anyway. You can do all of the above in Wordpress by using the Google News Sitemap plugin, installing the Redirection plugin which automatically implements redirects when URLs change, and then changing your permalink structure to /%postname%-%post_id%/. Google News is extremely keen that sources have multiple contributors, so make sure that you have a good “authors” page set up which lists all of your writers, their credentials, and their email address/twitter. You should also link to a page that lists all of their content to demonstrate that they're active. There’s a specific field for this page in the application form, so make sure that you do it properly! Submit your news sitemap to Webmaster Tools, then submit the inclusion form. Typically you won’t hear back from them, but you can keep checking with a site:www.yoursite.com search in GN. If Google News rejects your request or simplys ignore it, reply to the automated email with a good case for why your site should be included. If you’ve got a strong offline brand, mention it. If you’ve won awards, talk about that too! 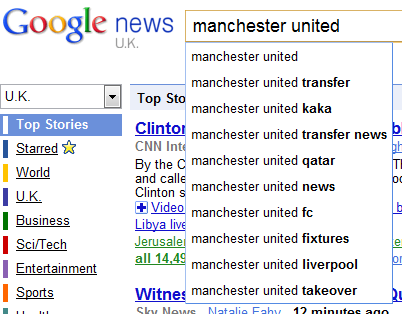 Google News do want to include good sources, sometimes you just need to let them know that's what you are.